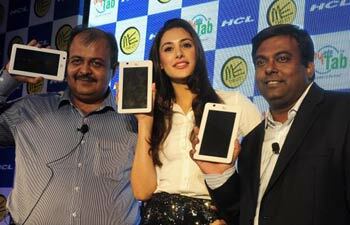 India's leading IT and technology company HCL has launched 3G enabled tablet ME Y2 at a price tag of Rs.14,999. The new device will be available in stores in Delhi and across the country from Tuesday onwards. According to the report published on The Mobile Indian, the tablet has the Cortex A9 1 GHz processor, 1 GB RAM and 8 GB internal memory, along with a memory card slot that can add another 32 GB. With the super fast Android OS 4.0.3 (Ice Cream Sandwich), the 3G enabled device is equipped with a 2-mega pixel rear camera and a 0.3-mega pixel front camera to enable video chatting with HD display, said the report. The ME Y2 also has a mini USB, mini HDMI and a Micro SD card slot along with having a robust 4000 mAH battery to deliver long hours of high definition audio and video playback. The new tablet, which boasts of having Bluetooth for WiFi connectivity, will be supported by an integrated back up service - HCL Touch, a 24X7 one touch service facility. Making this announcement, the HCL said the tablet is packed with applications and special offers to suit the requirements of the Indian consumer. Speaking on the occasion, Gautam Advani, executive vice president and head, mobility, HCL Infosystems said, "The HCL ME Y2 is yet another value product from our company. This third generation tablet delivers enhanced experiences to our customers through advanced connectivity and innovative features." Further he said, "With the growth in tablet market and increasing adoption, on-the-go connectivity has become vital and the ME Y2 promises seamless connectivity with great user interface. The Y2 is yet another innovation from HCL and we expect it to meet the growing demand of our diverse customers to meet their specific use cases on the tablet." HCL ME Y2 Tablet is a pretty good looking at affordable Price. It has very powerful battery that will easily run for the day, connectivity, operating system, processor, and memory. Features such as Android 4.0.3 Ice Cream Sandwich operating system, 3G, Wi-Fi, Bluetooth.